Why rent a car in Malta? Malta is a great place for renting a car. The distances are small, but each city has its unique character and atmosphere. Having your own ride gives you the opportunity to also visit smaller villages and more private beaches all around the island. It’s also possible to take your rental car on a ferry from the main island of Malta to the smaller Gozo and Comino islands. Malta Airport: Malta Luqa Airport is served by many airlines, including a number of low-cost carriers, that connect it to mainland Europe, North Africa, and the Middle East. By sea: If your car provider permits it, you can take your rental on a ferry. It only takes about 90 minutes to reach Malta from Sicily by boat. You can also conveniently pick up your rental car after you’ve already arrived in Malta. 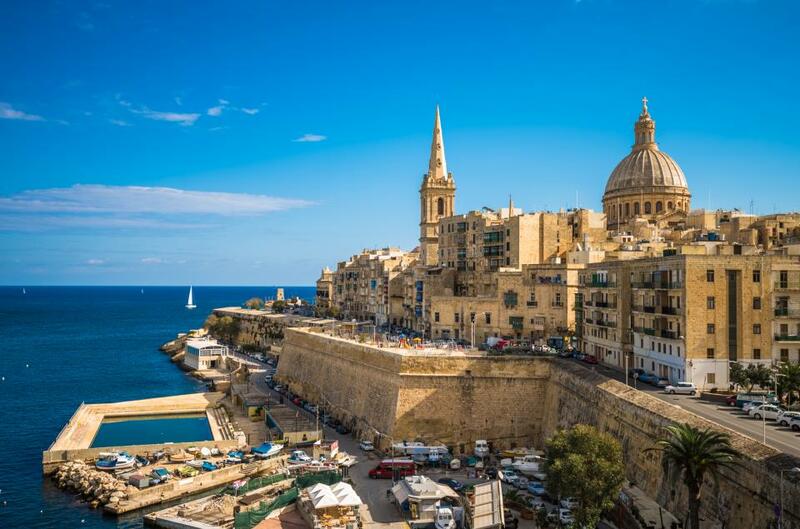 Valletta: Malta’s capital might not have a lot of people living in it, but next to its cozy atmosphere it is also famous for stunning history, architecture, and many religious buildings. Gozo Island: The smallest of the two islands making up Malta, Gozo also mixes wonderful sea coast with interesting history. One can find unique natural fetures, such as the Blue Hole and Inland Sea located in San Lawrenz. Unfortunately, the Azure Window collapsed a few years ago in bad weather. Cottonera: Made up of three different historic towns, Cottonera is known for its fort, churches, and Maritime Museum. Marsaxlokk: The main attraction of this cozy village is the weekly fish market that is still in place every Sunday. Rabat: Home to St. Paul’s catacombs and other historic landmarks, Rabat has a timeless feel. St. Julians: North of Valletta, St. Julians is packed with hotels, resturants, bars, and clubs. It is also a good place to find boat tours around the islands. The most popular rental car in Malta is the Fiat Panda, but the Peugeot 108 and the Ford Fiesta are also popular. The most popular rental car type in Malta is a Mini, followed by Economy and Compact. How can I save money on my rental car? Visit on the month when the rental prices are the cheapest. According to our data, visiting Malta is the cheapest in February when renting a car is about 50% cheaper than the yearly average and about 80% cheaper than renting a car in July. Which is the cheapest month to rent a car in Malta? The cost of renting a car in Malta depends on the time of year. This graph compares price changes from month to month in order to find the best offer. The cheapest month of the year to rent a car in Malta is February — prices start from $15.48 for an Economy class vehicle. This is 62% cheaper than the year’s average and 84% cheaper than renting a car in the month of July (when prices start at $94.86 for a Compact class). This information can help you identify the low season. But these are only average numbers. The exact price for your trip will depend on the length of your rental and the number of days until your rental period begins. Just enter your dates in the form at the top of the page to see exact prices and offers. What’s the average rental length in Malta? Average length differs from month to month. The longest rental periods are in February — an average of 6 days. The shortest are in July — an average of 4 days. What’s the most popular time for renting a car in Malta? Discover Car Hire users search a lot of locations daily. We gathered this information in order to analyze car rental popularity in Malta. The most popular month is August, while the least popular is December. Definitely a good idea to rent your own car because malta is not well connected by public transport.